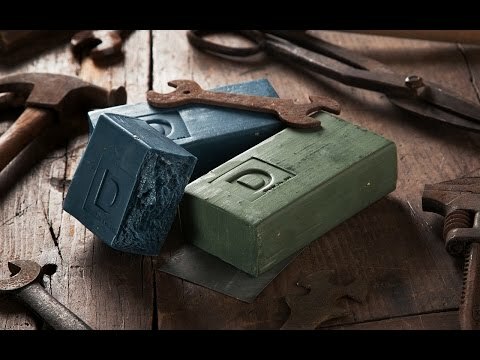 Sometimes a man does not want to use 'hand lotion', this is a manly way to have softer hands. Great name as well! Was a terrific stocking stuffer. I bought this for my son - he loved it! My son has been trying to find something that would work on his rough - raw- chapped hands and immediately knew this would do the trick. He loved the fact that it was non greasy. I ordered this for my son the builder, bike rider, rock climber; my son-in-law the avid cross fit and woodworker, and my husband who's outdoors a good bit. I have never gotten more thanks for a Christmas present. Everyone loves it, myself included. It takes very little, doesn't leave your hands the least bit greasy, and wow do your hands feel better instantly. I will be ordering again. Hands down the best stuff for working hands. Way better than O' Keefes. I use it everyday. Got it as a gift and have bought it twice more. Works on feet too. No scent. Great hand cream. Not flowery smelling or anything. Doesn't make my power tools slip out of my hands when I use it. I love Duke Cannon! Love how effective this stuff is. Unscented, no oily residue...everything I hated about hand cream, this Bloody Knuckles isn't! Best part? It absorbs quicker than I can chug my beer. This is the first hand cream that I've used that doesn't leave my hands feeling greasy or slimey. 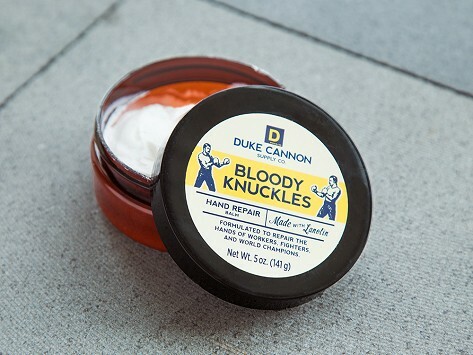 Another great product from Duke Cannon! I'm really impressed with this product. Way better than O'keefes! It works great on hands, feet, elbows. No greasy residue at all like it says. Unscented. I'm hooked.